Prime Minister David Cameron has said there can be "no excuse" for outside military intervention in Ukraine. He was speaking after the Russian parliament approved President Putin's request to deploy troops there. Mr Cameron said everyone "must work to lower, not escalate, tensions. The world is watching." Foreign Secretary William Hague said he had passed this message to his Russian counterpart, Sergei Lavrov, in a phone call earlier on Saturday. Mr Hague said Ukraine's sovereignty over the Crimea region should be respected and Britain opposed Russian moves to use troops there. He added: "We have now summoned the Russian ambassador to the Foreign Office to register our deep concerns." We are trying to keep a low profile as advised by the FCO [Foreign & Commonwealth Office]. We cannot do much else. I have been trying to get through to the FCO but they seem permanently closed. I appreciate that there is no specific threat against British citizens, but the real risk remains, as demonstrated by Vitali Klitschko [the former boxer turned politician], that an armed conflict could be imminent. It is worrying as we do not know how Ukraine will react to Russia or if they will start a war. The population here is not as pro-Russian as you might think. There are many Russians living here but they are not necessarily loyal to Putin. The British Embassy offers no help at all. Basically if you are not in jail or kidnapped, there is not much that they will do for you as a Brit abroad. If you look at their own website, they list what they will do, and it is not very much. The main trouble is getting any reliable information, as things are getting a bit hectic here and the situation is changing so rapidly. Mr Hague said Britain had called an urgent meeting of the United Nations Security Council to discuss Ukraine and supported the Ukrainian government's request for urgent consultations in accordance with the 1994 Budapest Memorandum, signed by the UK, the US, Russia and Ukraine. Signatories of the memorandum committed not to use any force that threatened Ukraine's territorial integrity or political independence, and not to use weapons against Ukraine except in self-defence. Mr Hague, who is due to travel to Ukraine on Sunday, said Britain would condemn any act of aggression against the country. He said he would make clear Britain's support for the new Ukrainian government and discuss how the UK could help it recover "improperly acquired assets". He added that the EU must "agree urgently an asset freezing regime to target those suspected of laundering the proceeds of corruption". The Foreign Office later released a statement following the meeting between Russia's ambassador to the UK, Alexander Vladimirovich Yakovenko, and FCO political director, Simon Gass. It said Mr Gass had "expressed deep concern at the Russian parliament's decision to authorise military action in Ukraine against the wishes of the Ukrainian government". The political director had "asked the ambassador to urge his government to respect the sovereignty, independence and territorial integrity of Ukraine", it added. Shadow foreign secretary Douglas Alexander said: "The vote in the Russian parliament to approve Russian forces being mobilised is deeply concerning and represents a potentially grave escalation of the situation in Ukraine. "All efforts must be made to try to secure a diplomatic resolution to the crisis." Tensions have been high since Ukraine's elected president, Viktor Yanukovych, was ousted in a popular uprising on 22 February. His removal from power followed four months of street protests that culminated in bloody clashes between demonstrators and security forces. The Foreign Office now advises against all travel to Crimea and says British nationals there "should leave now by any practical means". 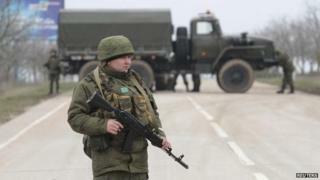 On Friday, the airport at Simferopol in Crimea was reported to have been seized by armed men. The Foreign Office said the airport was reported to be operating as usual but it did not advise British nationals to try to leave from there until the situation had become clearer. It said it was not able to provide consular services to anyone who chose to remain in Crimea. It said anyone who did stay in the area should "keep a low profile, avoid areas of protest or stand-off and stay indoors where possible". One British citizen living in Simferopol with his Ukrainian wife and three-year-old daughter said he was trying to keep a low profile, as advised. Speaking on condition of anonymity, he said: "I appreciate that there is no specific threat against British citizens, but the real risk remains that an armed conflict could be imminent. "The British Embassy offers no help at all. Basically if you are not in jail or kidnapped, there is not much that they will do for you as a Brit abroad." He said he had tried and failed to contact British officials. The Foreign Office said the British embassy in the Ukrainian capital, Kiev, was now open to the public by appointment only.